This post is mostly for Aunty And (happy birthday btw!) so she can see how much fun the boys are having with her gift these days. Happy Mothers Day! (Okay, I'm a week behind) I had a great one beginning with a nice breakfast of orange rolls and some fun gifts. Thanks guys! We had dinner with my mom where the boys were way excited to give her the stepping stones they had made for her garden. A few days later, we went over and helped put in the huge vegetable garden at their house. M started sports this year and he chose t-ball. His first game was on Monday and he did great! He played catcher one inning, was on the bench one, and got 3 runs! His team is the Giants, and he is really proud of his black and orange uniform. He is #2 and his good friend is #1. The pictures were so cute, I had to share. Last week for school we had a Cinco de Mayo party and then on Thurs. went to the Hill AF Base Museum. It is always a hoot to hear what the kids talk about. They ended up talking about killer ants most of the time we were looking at the planes, then we stopped for our snacks and they compared each plane to Clifford the Big Red Dog and argued over which planes he was bigger than. You just never know. I think their favorite of the Cinco de Mayo party was getting to put on the giant Sombrero and count to 10 in spanish while playing hide and seek. Today I have a new kitchen sink and faucet, and the holes/dings/dents in my walls are patched! I didn't even help with much of it. We found out our walls are painted with oil-based paint and I'm glad I was gone for some of the day while he was doing the touch-ups because the fumes are crazy strong. At least we were able to (sort of) match the paint. Next we need to attack the Lightning McQueen border in the office/nursery. It's got to go. Where was I? Fabric shopping! I've wanted to get out and do that for a long time, but I just can't go with the boys anymore, those days are just over. (they don't get easier as they get older!) They cringe at the mere mention of a fabric store these days. So I invited my mom to come and we hit 3 shops. She spent twice as much as I did- (sorry for inviting you mom!) She has the makings for 2 quilts, and I got fabric for a new diaper bag, 6 burp cloths, and a bundler. 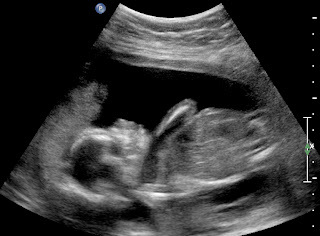 Yep, we're pregnant with a 3rd boy! I guess I'd better get on the ball and learn my superheroes/star wars characters already! 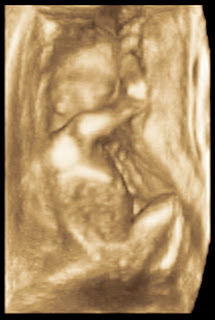 We're expecting in October a few days after M's 5th birthday and we're very excited. He doesn't have a name yet, but I guess it will only be an initial here anyways. 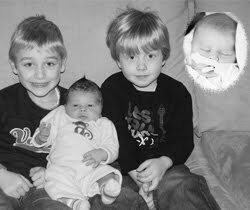 The boys are surprised it's not a sister and E still denies it is a brother baby, but the tech seemed like she was pretty darn confident of those little boy parts! The last day of our trip! I'm sure you are all relieved, but I really like to write it down for myself at least, since this is a journal of sorts. We packed up and got checked out, then since we still had hours until opening, we decided to forgo the free but generally lacking continental breakfast and do breakfast at the La Brea Bakery Cafe in downtown disney. It was yummy. We wandered a bit, but no shops were open. We got to the gates in California Adventure plenty early and got to the rope drop that was closest to Toy Story Mania (not close at all) After doing that twice, we split up, Dad and E did it a third time- M and I rode 3 rides at Paradise Pier, and Mom and DH headed back for their (I think) 3rd and 4th rides on California Screamin' (can you tell they were the thrill riders?) It was a hot day and I got quite the sunburn. I think the rest did Soarin' again while I took the boys to Playhouse Disney Live, then we rushed to see Alladin, the main reason for the 4 day stay, as it was only playing Thurs-Sat. E got really freaked right before it was about to start and started crying LOUDLY. My mom took him out, but afterwards we found out they ended up watching the whole show, but from the back row, which I guess felt safer for some reason. It was really good and M especially enjoyed the humor of the Genie. He is still repeating some of the more corny jokes. At this point, we thought E may have a fever, and went to buy Tylenol. If you go to Disneyland, just ask for medicine at the checkout- they have a lot but it's not out on display. Just a tip. We left California Adventure and went back to Disneyland one last time. We got pictures in front of Walt and the Castle, bought a few last minute things, and rode Buzz Lightyear once or twice. Then the kids konked out and we had another peaceful lunch, this time in downtown disney on a patio. The DH had a taco cone thingy that looked cool, but was hard to eat. The rest is all traffic, driving, car sickness, and more driving and traffic. It's not very exciting. We stayed at Buffalo Bill's again (again, the $5) but got in late and crashed. That's it- and for those who are wondering, NO this is not an annual thing- after my parents took us all to Disneyworld last year, we thought it would be fun to try the California flavor before our family became a little less vacation-friendly (and this is before we had decided to try and sell our house) and then we invited my parents along so they could enjoy watching the boys have fun. We probably won't do Disney again for a while. Day 3 of Disneyland- we were right at the front for rope drop- see the thousands of people in back of us? We rushed to Peter Pan, since it was always so insane we still hadn't ridden it- and it's pretty much the boys' favorite ride (every other kid's too) After that, we rode Dumbo, Autopia, teacups- then met up with our good friends the Blacks for the Jedi Training, which M and their son, D were chosen for! 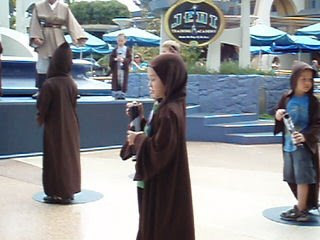 It was way cute to watch these little kids dress in robes and be trained on how to use their lightsabers. When they were done training, the stage lifted up and out came Darth Vader, Darth Maul, and some other guys (I didn't say I was a Star Wars expert) which they had a chance to fight using their new skills individually. M fought Darth Maul, and D fought Darth Vader. It was a really cool show, and a highlight for the boys. We split up and the moms and 3 year olds did Tiki room while the others did Space Mtn. and Star Tours. Then it was Jungle Cruise for the moms and kids (that was crazy being outnumbered by wild children on a crowded boat) After lunch, the dads had a chance to take the kids to Pirate Island while we rode Indiana Jones. We met up with my parents and had another wet Splash Mtn. experience, this time with all 5 of us that could go so we could buy the picture. It was a pretty jam packed day. I took the Black's daughter, K, to see Pooh and Tigger while they rode Splash, and I got a lot of comments about how lucky I was to get a redhead that looked just like me. She was super confused when the photographer kept telling her to "look at mommy" when I was snapping pictures of her, she was looking everywhere but at ME. It was funny. We split up at this point and me, my dad, and kids went to Toontown and met Mickey and rode the world's shortest roller coaster. As a last request by E, we rode Small World, after which the boys fell asleep and we had a nice peaceful meal at the French Market for dinner while they slept in their strollers. After a bit of shopping for some ornaments, we went back to the hotel and E never woke up. M woke up refreshed and wanting to try out the pool, this being his last chance. I was the only taker, so we headed down and I enjoyed the hot tub which was about as hot as a bath. We rode Mr. Toad and did the castle tour then it was too insane at Disneyland, so we went over to California Adventure. We first went to Bug's land, where we rode some rides, and I stayed a while with the kids while the others did Tower of Terror. After riding Toy Story Mania, we checked out the cute shop. That was the longest line we waited in, and probably because we insisted on doing it in the afternoon. We rode it again 3 times on Thursday morning. At this point, E fell asleep and sat in the shade with Grandpa, Mom and DH were riding crazy rollercoasters, so M and I had some time and he chose to go on Monsters, Inc. Here he is in front of Boo's door. E was starting to wake up, and mom, dad, and M had gone to Tower of Terror, so we got in line to meet Goofy. Well, he never quite woke up but we snapped a picture anyway. After seeing the Pixar Parade, CA was closed, so we shopped (of course!) in Downtown Disney and had a yummy dinner at Ralph Brennon's Jazz Kitchen. The highlight for the 3 boys was the Lego store. After that, we were pooped and dropped to sleep fast. On Monday morning, we got up and started driving to Disneyland. It is about a 4 hr. drive, plus parking at our hotel and walking over, getting our tickets, etc.. so we thought this would be a half day. Well, the kids (and I) woke up VERY early and so even with all that, we were there at opening! We're crazy. Here are the boys pumped and ready to hit the road sometime before 6am. Waiting in line to get our tickets. While DH and I were on Splash Mountain (getting completely soaked- it was bizarre) Grandma and Grandpa waited in the line to meet Pooh and Tigger. E and I were the only ones to ride the carousel- everyone else was on Thunder Mtn. He really loved it and was proud that he'd found us 2 green horses right next to each other. The boys rode here as often as their strollers I think. Sorry Dad! Being "wild animals" on the Casey Jr. Circus train. M was hilarious at the parade, he just kept snapping hundreds of pictures. I don't know how much he saw, but he sure enjoyed himself with that old camera of ours. At one point, he got picked to go out and dance and was upset because it interrupted his photography. After the parade, it was dead and we rode Buzz Lightyear 2 or 3 times in a row. Tried to get a night shot of the castle.